Every now and then during this trip, we discussed how we would answer the inevitable question, “What was your favorite part?” It’s too difficult a question to answer, but if pressed, this day stands out as a front-runner. Out of everyone who arrived at the lodge when we did, Andrea and I were the only ones who had booked a 4-day/3-night stay. Everyone else was leaving in the afternoon on this day, which made us the only guests to sign up for the full-day activity: kayaking to Aialik Glacier. We made packed lunches from ingredients laid out on the bar and met our guide on the porch at 8:45 a.m. We had heard about this guide—and she us—as she hailed from Michigan, and word had gotten around that there were fellow Michiganders about. For reasons that are not easily explained, this was exciting. Since Andrea and I were her only charges, we immediately began swapping information - Where are you from? How did you end up here? Etc. Amazingly, she grew up about an hour from where I live, and now we were meeting on the porch of a lodge in the woods in Alaska. 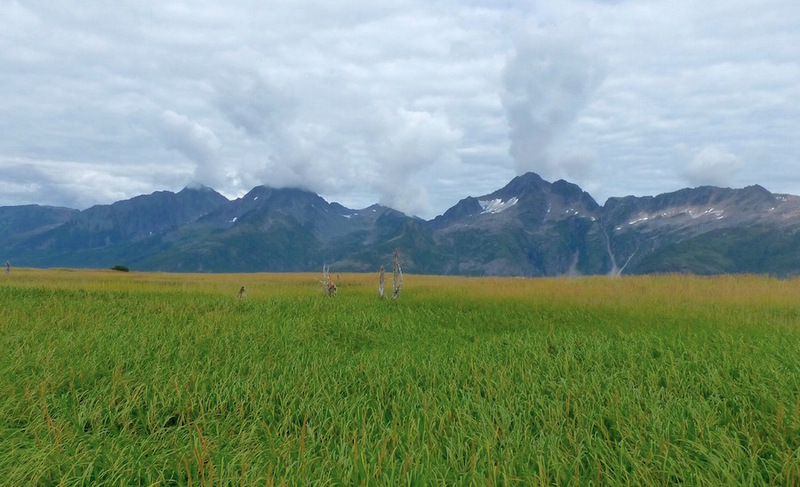 The three of us walked back the way we had come when we first arrived at the lodge - back through the woods, across the meadow, and to the cobble beach, where sea kayaks waited. It was warmer than the previous days and partly sunny, which was a welcomed change of pace. The jacket I was wearing was not needed, so I stashed it in my backpack before stowing everything in the kayak and setting off. 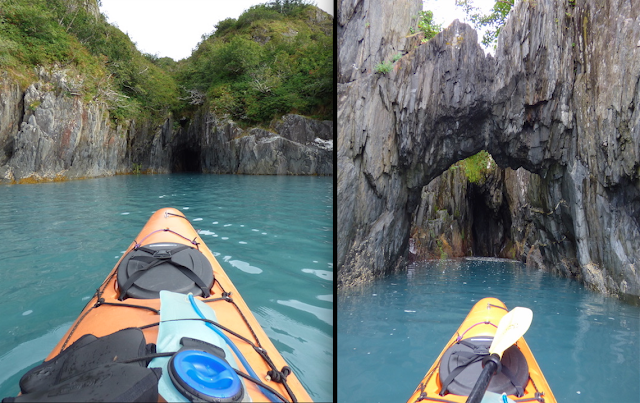 The plan was to paddle to Slate Island - a small, rocky island approximately four miles away - and do a little exploring there before paddling a mile or two further to view the glacier. We would stop for lunch, either on shore somewhere or floating in our kayaks depending on the situation, and head back in the afternoon. Paddling into a cove in Slate Island. Water trickled from above, creating wonderful sounds. We paddled and talked with our guide, exchanging stories about our favorite places to hike and camp in Michigan. Once at Slate Island, we hugged its eastern side and explored a couple of narrow coves in the rock, paddling into deep crevices and enjoying the sound of the waves thumping and sloshing against the steep rock walls. (For a video of one of these crevices, go here.) We then pulled ashore to take a break on the island. A small, gravelly area made a good resting place for our kayaks, and we drank warm cider and hot chocolate and ate granola bars while hanging out amongst the rocks and occasional unfortunate jellyfish that had washed ashore. 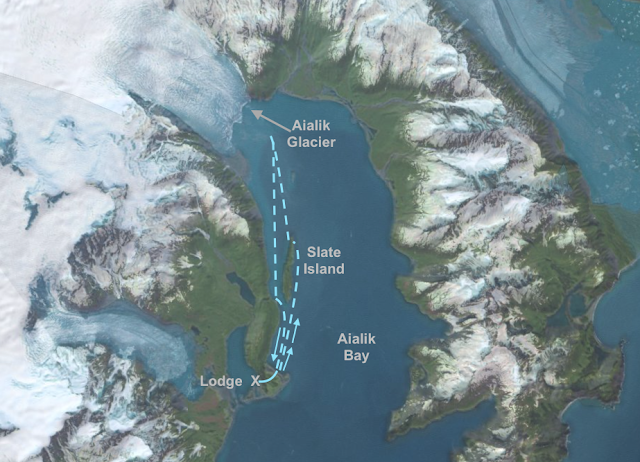 We resumed paddling, planning to round the island’s north end, which would put us almost face-to-face with Aialik Glacier. But instead of going around the island, we ended up taking advantage of a narrow passageway that had become available due to the rising tide between two chunks of the island that look to have separated from each other at the far northern end. The tide was just high enough for us to push through, with a bit of a stall in the middle when we lost speed and the undulating water tried pulling us down. 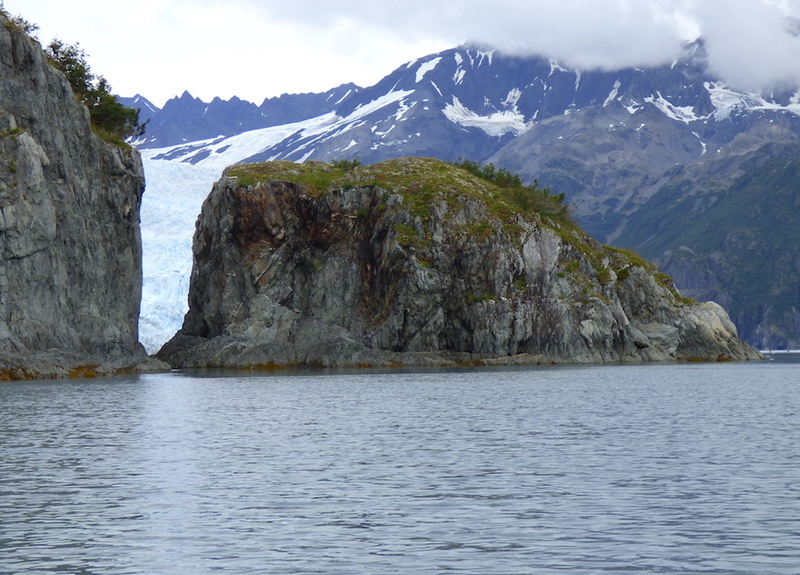 Once another surge of water pushed at the back of our kayak, we scooted all the way through and were met with the face of Aialik Glacier - still a few miles in the distance, though it appeared reachable with just a few paddle strokes. Aialik Glacier can be seen through the split in the rock at Slate Island's north end. 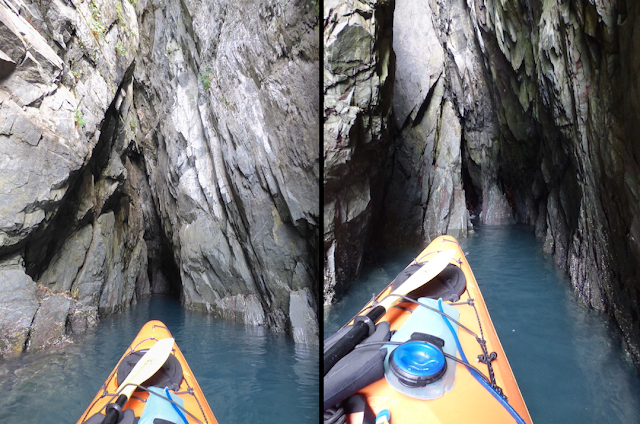 Paddling through the opening in Slate Island. Photo by Andrea. My camera was constantly getting wet. It was a trooper. 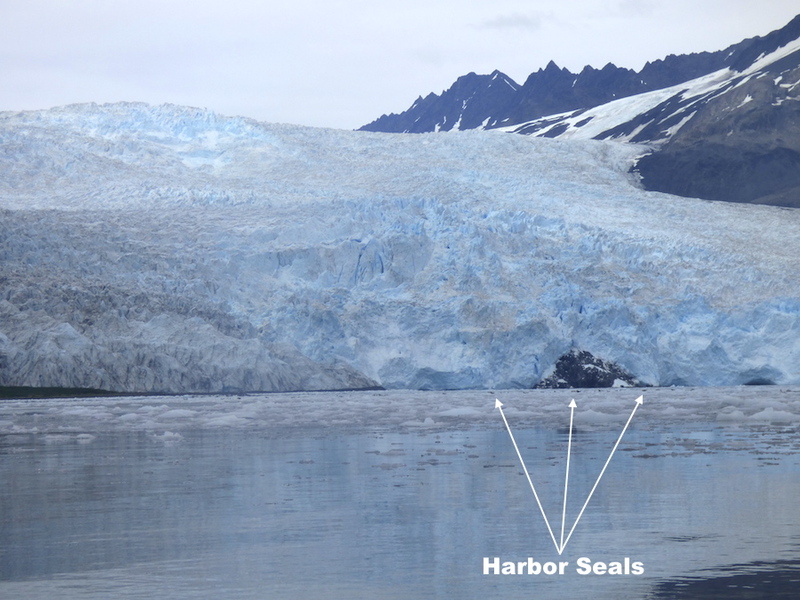 In the distance toward the glacier and the surrounding shore, we could see harbor seals popping their heads out of the water to look at us, but the majority were hauled out on big slabs of ice. Our guide explained that the seals were molting at this time, and those that were hauled out were deliberately staying out of the water and fasting while their hair regrew. She added that people should take care to stay away from them at this time so as not to scare them into the water unnecessarily during this process. The seals seemed curious about us; apparently to a seal, the shape of a kayak with a person sitting in it can resemble an orca, and our guide indicated they were probably scoping us out to determine if we were a threat. Harbor seal hauled out on the ice. Photos taken at a distance with a zoom lens. A curious harbor seal checks us out. We stopped paddling when we were estimated to still be around a mile away from the glacier’s terminus, despite how close it looked. Giving the seals their space was one reason; the other was to be a enough of a distance away to avoid the consequences of any massive waves caused by calving. The face of Aialik Glacier is approximately 300 feet tall and around a mile wide. When a large mass of ice calves and falls into the sea below, it can be an impressive event. We witnessed this happen a few times while observing the glacier. The sound is exactly like thunder - it rumbles and booms and is amazingly loud even at a distance. The first time it happened, Andrea and I both looked up at the sky thinking the weather was turning. It took us a minute to realize the source of the sound, partially because of how it sounded, but also because of when we heard it. Several seconds passed from when we saw the ice fall to when the sound reached us, reminding us again that the size of the glacier and mountains was deceiving, and they were much further away than they seemed. The waves caused by a large chunk of glacier plummeting into the water can be substantial. We watched a large tour boat come in close to the glacier, only to throw itself in reverse and hastily retreat after a huge chunk of ice calved near it. The hulking boat looked like a toy next to the massive wall of blue ice. 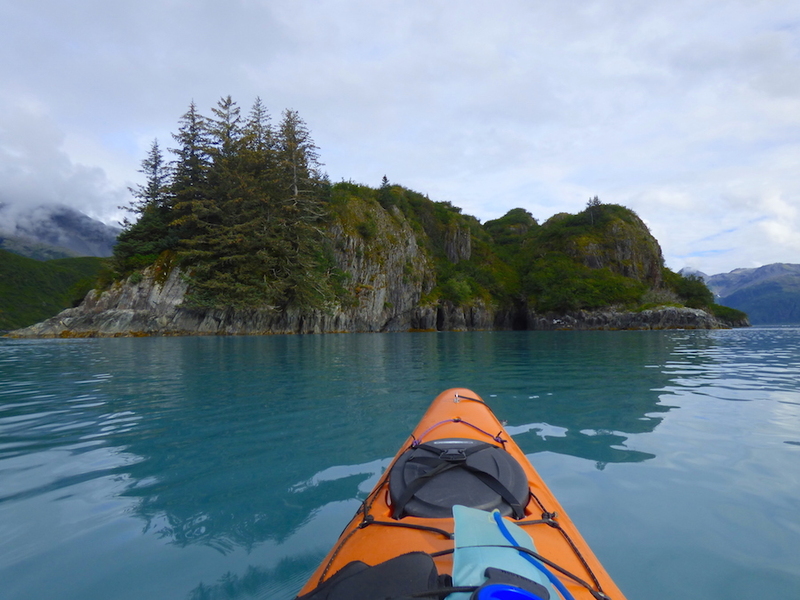 After lingering at the glacier for a while, we began paddling back toward Slate Island, this time making our way between the west side of the island and the mainland. As we paddled close to the island’s steep rocky face, we noticed some puffins nesting in the rock. We spent a few minutes watching them, then things got interesting (because up to this point, the day had obviously been a snoozer). Our guide brought our attention to something moving in the water ahead of us. “I’m not positive, but that might be a bear. Let’s get a closer look.” We paddled a bit closer and confirmed - we were looking at the floating head of a swimming bear. Alaska is awesome! 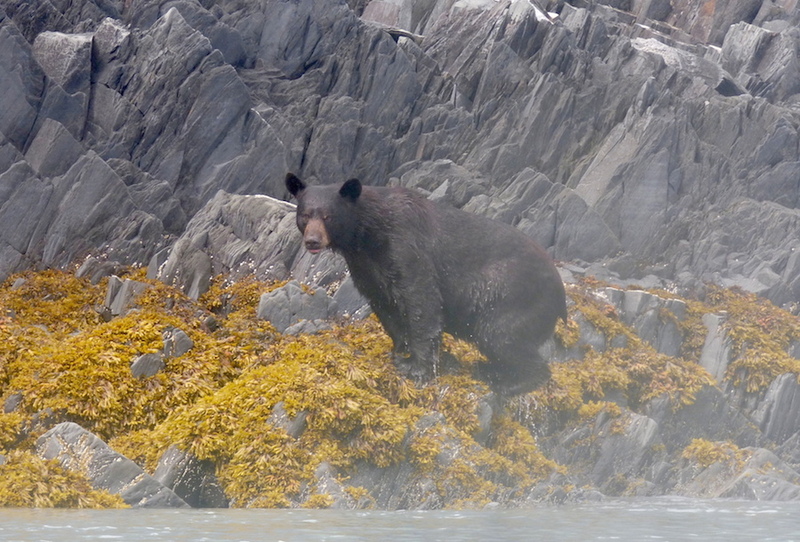 A black bear swimming from Slate Island to the mainland in Aialik Bay. All bear photos were taken from a distance with a zoom lens. Although we were excited and wanted to get a closer look, we were careful to stay far enough away so as not freak the bear out. We did not want to harass it, or become the first people to be chased by a swimming bear while kayaking. It looked to be swimming back to the mainland from Slate Island, and our guide speculated that it had gone to the island for berries, which are a significant part of the black bears’ diet. We continued paddling behind the bear, watching its furry ears make their way toward shore. It knew we were there, at one point turning its head to take a quick glance back at us. We eased up on the paddling and just waited offshore, watching. Andrea’s camera battery chose that moment to die, so she kept our kayak a steady distance offshore while I photographed the bear. My camera’s lens had gotten very wet, not only from water dripping off my paddle while kayaking, but constantly on this trip in general due to the ever-present rain, and I was amazed and grateful that I could capture anything at this point through its foggy glass. After a bit of editing to deal with the lens fog, I ended up with some decent photos of this impressive guy. The bear reached shore, climbed out of the water and onto the seaweed-covered rocks, and stood motionless for a minute or two - watching us and heaving in lungfuls of air to catch its breath. It was a very large male black bear, with huge paws and a broad torso. He began walking, stopping after a few steps to shake himself dry like a dog. We spent the next 30 minutes or so slowly paddling offshore, parallel to the bear’s path as it walked along the rock and ate berries from bushes along the way. We were in no hurry, so we kept with the bear’s leisurely pace, just floating and watching. Paddling to Aialik Glacier was an awesome adventure by itself, and we were further awestruck by this unexpected addition to an already spectacular day. For a video of the swimming, strolling, berry-munching bear, go here. At some point, our guide was able to retrieve a new battery for Andrea’s camera from the gear stowed in our kayak’s compartment. She also radioed another guide she knew to be nearby with a group of kayakers to let him know about the bear sighting. This other group showed up within a few minutes and paddled alongside us. The bear continued on its path toward Slate Beach - a stretch of beach where, unfortunately, we had planned to stop for lunch. Before reaching the beach, however, it turned inland and disappeared into the brush. We were discussing eating lunch in our kayaks due to the bear’s proximity to the beach, but the other group paddled right up to the beach and got out. They were meeting a water taxi, and this beach was their pick-up location. Their guide grabbed two rocks and banged them together for a while to make an excess of noise intending to keep the bear from visiting the beach. Figuring there were enough people there for it not be an issue, we decided to join the group for a quick lunch break. We beached our kayaks and unpacked our lunches. It was a beautiful day to picnic on the beach; the weather was warm, the water was calm, and the scenery couldn’t be beat. The bear agreed. About 15 minutes after we arrived, he emerged from the brush on the beach’s west side. We didn’t see it right away, but we heard the other guide suddenly shout, “Everyone get up!” The other group was between the bear and us, and we looked over to see them all stand up and walk backwards toward the water, watching the bear stroll among the bushes bordering the beach. It was so focused on eating berries that it appeared not to notice any of us. Still, it was time to leave. As we quickly packed up our lunches and gear, the other group’s ride showed up - a water taxi driven by the same boat skipper that brought us to the lodge. We arrived back at the beach near the lodge around 3:30 p.m. and headed back to our cabin to shower and relax before dinner. We spent some time sitting on our back porch, then headed to the main lodge to hang out at the bar/lounge area before dinner. A new batch of guests had arrived while we were out, and people were standing around meeting each other, talking, and looking around at this wonderful place where they were going to be spending the next few days. A young boy was looking at Pedersen Glacier through the telescope at the picture window, when suddenly (as he explained later) the view went black. He looked up to discover that a bear had wandered into his field of vision. He started yelling excitedly, and everyone ran to the windows to see a small black bear ambling through the grass near the lagoon - a perfect welcome for the new guests, and a fitting sight for us on our last night at the lodge. Unfortunately, a bunch of people ran outside toward the bear, immediately forgetting any etiquette regarding wildlife and their surroundings that they may have learned upon arrival. (Well, it was pretty exciting.) Lodge employees had to corral everyone back inside, reminding them that the wildlife needs to be left alone, and that people should remain safely inside. The halibut dinner that night was excellent, and we spent it talking to some of the new people who arrived. Two couples, maybe in their mid to late 50s, were sitting near us. The two men and one of the women were happy to be there; the other woman, however, looked as though she was enduring an experience in which she had no interest. The jellyfish we had seen washed ashore earlier in the day had seemed more excited. Her whole attitude said, “I was dragged here,” like a teenager on a dreaded family trip, and she quietly scoffed at the things the lodge manager was saying during this group’s orientation during dinner. (She was not going to leave her personal food in a baggie with her name on it in the main lodge like some commoner.) I wanted to put her on an iceberg and push her out to sea. She bummed me out. After dinner, we sat on the chairs on the back deck of the lodge for a little while, but headed to our cabin once the inevitable daily rain started. This was our final night in this amazing place, and although I looked forward to the next phase of our trip, I wanted to make this night last as long as possible. I also wanted to get a photo at night outside of our lit-up cabin, so I stayed awake for as long as I could, but the never-ceasing rain and the fact that it doesn't get dark until really late at this time were working against me. I had to compromise with a photograph taken at 10 pm that looks like it’s broad daylight, but the sky is at least overcast and the cabin light is on. Andrea had fallen asleep in the middle of a conversation about an hour earlier, and I was too tired to stay up any longer despite how hard I tried. The next day we had enough time for a half-day excursion before we were scheduled to return to Seward in the afternoon. I laid in bed looking out the glass door at the lagoon and the mountains beyond. I was still so amazed to be there, and mixed thoughts and feelings swirled in my mind: I was going to miss this cabin. We pursued a swimming bear! What would we see tomorrow? What would the next phase of our trip be like? Was that woman dropping snack food crumbs outside of her cabin? What kind of snacks did she have that were so special they couldn’t congregate with the likes of ours in the lodge cupboard?